During 2011 I wrote a number of posts for the project called The Art Of Life Magazine – of course talking about my favorite subject, wine. The project was closed and even the web site is down, but as I still like the posts I wrote, I decided to re-post them in this blog. Also, in that project, posts were grouped into the mini-series, such as “Best Hidden Secrets” and “Forgotten Vines”. The post I’m offering to you today was from the mini-series called “Liquid Pleasures Beyond Wine”, and the subject of this post is Whiskey. Well, it is almost an original – I had to make a few small edits. In the previous post about Whiskey, we focused solely on Scotch, a malt Whisky produced in Scotland. The whole world of Whiskey (see, we are even changing the spelling from whisky to whiskey to accommodate the change) is much larger, with various kinds of whiskey coming the from different places all over the globe. Let’s take a look at those places. We can and should start from Ireland – a close neighbor of the Scotland. Despite the “geographical closeness”, Irish Whiskeys are typically very different in style from the Scotch – to be more precise, they are much lighter. There are a few factors which define the lighter taste of the Irish Whiskeys. First, they are usually triple-distilled, versus double distillation process used in production of the Scotch. The next factor is reduced use of a peat smoke (actually, it is practically not used with some exceptions, such as Connemara, which is nicely peated). Lastly, many Irish whiskeys are made from the mix of grains as opposed to the malted barley used in Scotch production, which also leads to the lighter tasting final product. Irish Whiskeys are probably the oldest distilled spirit produced in Europe – at least based on information in Wikipedia, with the first notices going back to the 12th century. While there are only four acting distilleries in Ireland, one of those four, Old Bushmills Distillery claims to be the oldest officially recognized distillery in the world, tracing its history to 1608 (hence the name of one of their Whiskies, 1608). Each one of the four distilleries produces a substantial number of different lines of whiskey, so there is a good variety of the Irish Whiskeys available in the stores today. 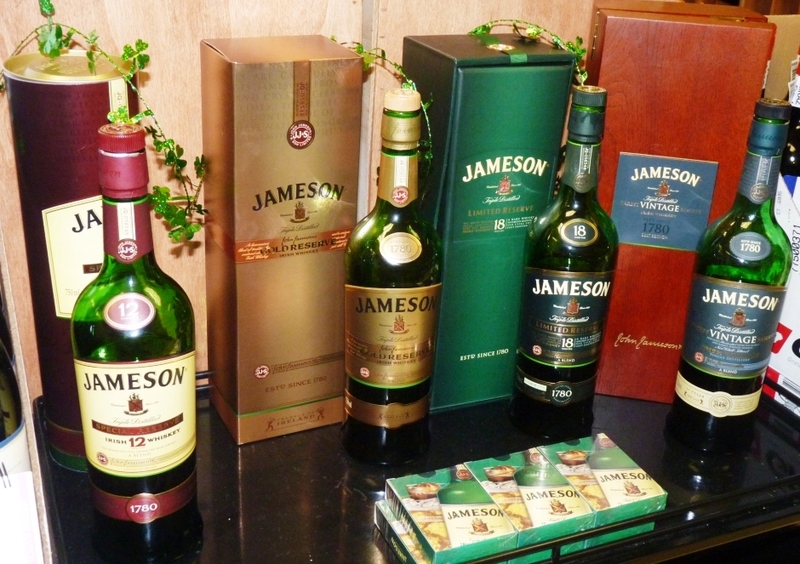 Some of the best known examples of Irish Whiskey include Jameson, Bushmills, 1608, Tullamore Dew – but of course there are lots more. In addition to US, a number of other countries should be mentioned here as the world-class Whiskey producers (I would be curious to know if you would be able to guess what those are, so pause your reading for a moment). To answer my own trivia question, here are some of them – Japan, Taiwan and India (surprised?). In all of those countries, blended and single malt whiskeys are made in the best tradition of Scotch Whisky. 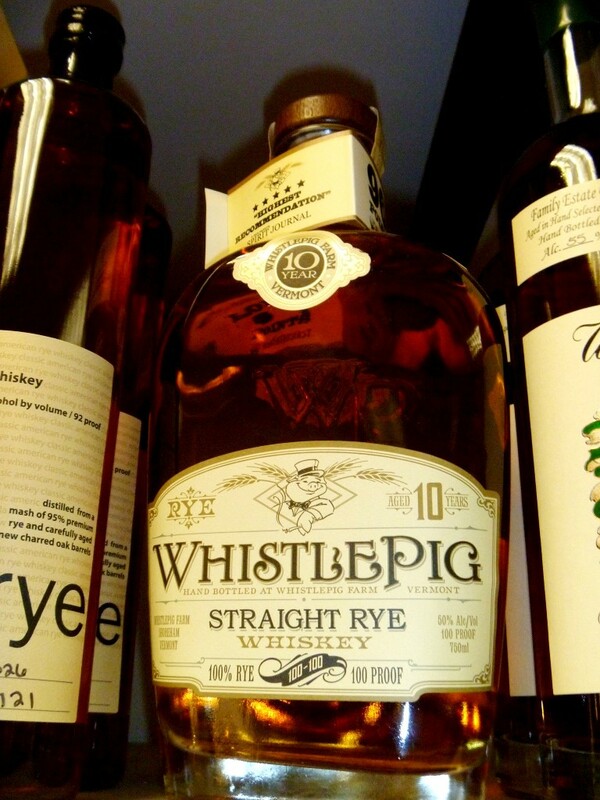 Whiskeys from those countries are quite rare and hard to find, but definitely worth seeking. One of the most famous Japanese Whiskeys is called Yamazaki and it is made as 12 and 18 years old single malts, using copper pot stills very similar to those used in Scotland. Another Japanese whiskey which is somewhat available in US is Hibiki, which is a blended 12 years old (there is also Hibiki 18, but it is even harder to find). Both Yamazaki, Hibiki and many others are owned by Suntory, a Japanese conglomerate. Then there is Amrut, which produces whiskey in India, again using the Scotch methodology – with very good results. Amrut produces a number of single malt and blended whiskeys – for more information and tasting notes you can read this blog post. With this we are finishing our exploration of the world of Whiskeys – and remember that paper exercise can not replace an actual experience which a good whiskey can bring. If you never had whiskey before, you need to resolve to try it now. For those who already knows the beauty of the Whiskey spirit – pour some of your favorite in the glass and cheers! During 2011 I wrote a number of posts for the project called The Art Of Life Magazine – of course talking about my favorite subject, wine. The project was closed and even the web site is down, but as I still like the posts I wrote, I decided to re-post them in this blog. Also, in that project, posts were grouped into the mini-series, such as “Best Hidden Secrets” and “Forgotten Vines”. The post I’m offering to you today was from the mini-series called “Liquid Pleasures Beyond Wine”, and the subject of this post is Scotch Whisky. Moving from grapes to grains (last week’s subject – Brandy), now is the time to talk about literally my favorite spirit: Scotch Whisky, or simply Scotch for a shorter name. Scotch is a part of a broader category of spirits which are called Whiskey, which is a distilled alcoholic beverage made from the fermented grains. While Whiskey can be produced anywhere in the world, Scotch Whisky can be produced … yep, only in Scotland (by the way, note the spelling difference – Whisky versus Whiskey, and make no mistake using the right spelling when talking about Scotch – it is Whisky). First mentions of the Scotch Whisky (will just refer to it as Scotch from here on) go all the way back to the end of the 15th century, so this alcoholic beverage has quite a bit of heritage and knew very turbulent times in its half a millennia history. Scotch can be made from different grains such as barley, wheat and so on, but many particularly famous Scotches are made from malted barley, and typically are called “malt”. And then if you ever paid attention to Scotch, I’m sure you heard of a “single malt” – that is a Whisky which is made out of malted barley at a single distillery. So just to emphasize – “single” here refers to a single distillery, and an opposite of single would be “blended”, in case Scotch from two or more distilleries is blended together. 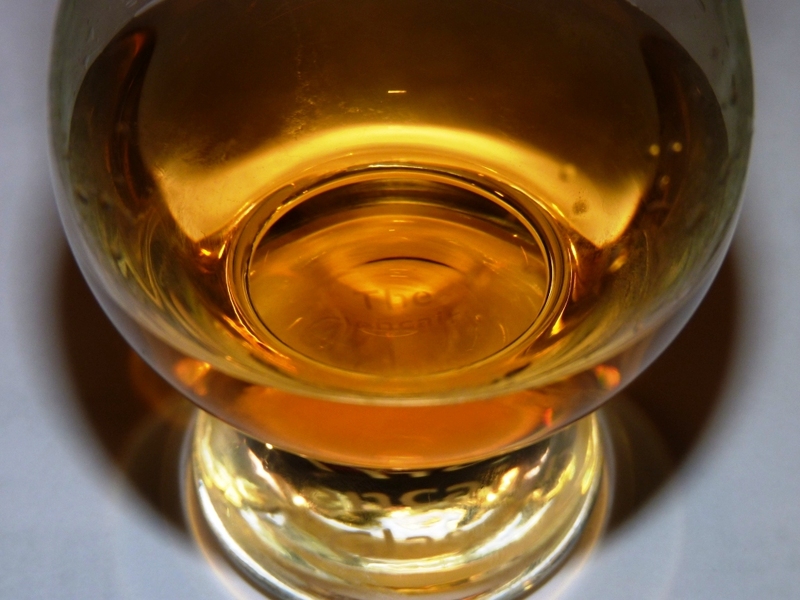 By the way – don’t be afraid of the blended Scotch – a lot of them are on par with the best single malts. Making of the malted Scotch starts from the barley, which is steeped with water for some time to start germination process – during this process, complex starches will be broken down and converted into sugar. Next step is drying of the barley, which is typically done in the pit, using heated air. The heat is coming from burning of the peat (fossil fuel), which imparts the smoky flavor on the grains; later on the smoke becomes the part of the flavor profile of the final product – the intensity of the smoke varies greatly among different areas and different producers. Dried grains are coarsely ground and will be steeped with the hot water and will become a sugary liquid. Next step is cooling off and then start of the fermentation process, which technically results in the beer with 7%-8% alcohol. From here on, the liquid goes through the first and second distillation process, which will get the level of alcohol anywhere between 40% and 94%, and then it is put in the oak barrels to age. The minimum age for Scotch is 3 years, but if we are talking about single malts, majority of them would age for 10 or 12 years (12 years seems to be a very popular demarcation line for introductory level Scotch from a lot of producers), and from there it can continue aging until it reaches 18-19 years (anything in between also goes). 25 and 30 years also seem to be a popular option, and 40-50 years old are not so rare – but keep in mind that the age of the Scotch will be appropriately reflected in the price (you expected that, right?). Before Scotch is bottled, the decision is made regarding the strength of the alcohol in the final product. Sometimes it can be released at so called “cask strength”, which can be anywhere from 50% to 60% ABV or even higher. But more often than not, it is diluted with water to get to 43% – 46% of alcohol in the final beverage. One important note – unlike wine, Scotch doesn’t age in the bottle – however, once it is opened, again unlike wine, it doesn’t spoil and can be kept indefinitely in the bottle, just don’t forget to put the cork back every time you pour a glass. With the same process used across the board (fermentation of the malted barley and [typically] double distillation), and the “fruit” (err, grain) being effectively the same (barley) versus many hundreds of different grapes used in the winemaking, would you expect that all the Scotch of the same age will taste the same? Well, it truly does not. What makes Scotches taste different? First of all, it is water, which is different in every Scotch-producing region. Then it is the type and intensity of peat smoke used for drying of the germinated grains. Of course the number of distillations matters, but more importantly it is the type or types of casks used for aging (some Scotches undergo aging in a few different types of casks before they are bottled) and the time of aging. Lastly, it is the type of filtering (or no filtering at all) which will also affect the taste of the final product. Oh yes, and a little bit of magic. There are five official areas where Scotch is produced – Lowland, Highland, Speyside, Campbeltown (never tasted anything from this area) and Islay. There are also a number of small islands which produce Scotch in a very distinct styles (like Skye, Orkney and others), but they are technically considered the part of the Highland region. Each distillery produces Scotch in its own unique style, but there can be some general similarities between scotches. If we paint flavor profile for the different regions, using very wide brushstrokes, we can say that Scotches from Highlands are typically very balanced and round, with good balance of acidity, flavor and spiciness. Lowlands flavor expression is usually toned down, and Speyside are very delicate and nuanced – Orkney scotches (Scappa) are similar to Speyside in their expressions, but probably add a touch more body. Islay and Skye produce very powerful and assertive scotches, exhibiting tremendous amount of peat (read: smoke); those who like them (me!) find them very pleasant. There are hundreds and hundreds of distilleries making great single malt and blended Scotches. If you want to learn about all of the distilleries, you can start from Wikipedia link, or Malt Madness web site. At the same time, I would be glad to share the list of some of my single malt favorites: Ardbeg Alligator (Islay), Cardhu 12 (Speyside), Lagavulin 16 (Islay), Laphroaig 16 (Islay), Glenfiddich 15 (Speyside), Scappa 14 and 16 (Orkney), Talisker 10 (Skye). Of course the world is not limited by the single malts only. 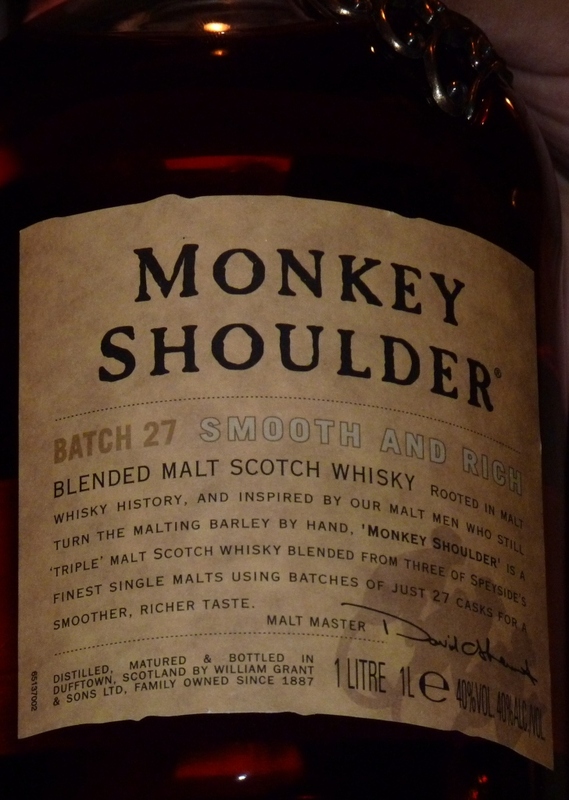 When it comes to blended whisky, there are a number of Whiskies which I can recommend – Johnnie Walker (Black, Gold, Blue), Chivas Regal 12 and 18, Monkey Shoulder, Compass Box, Blue Hanger, Black Bottle – and many others. 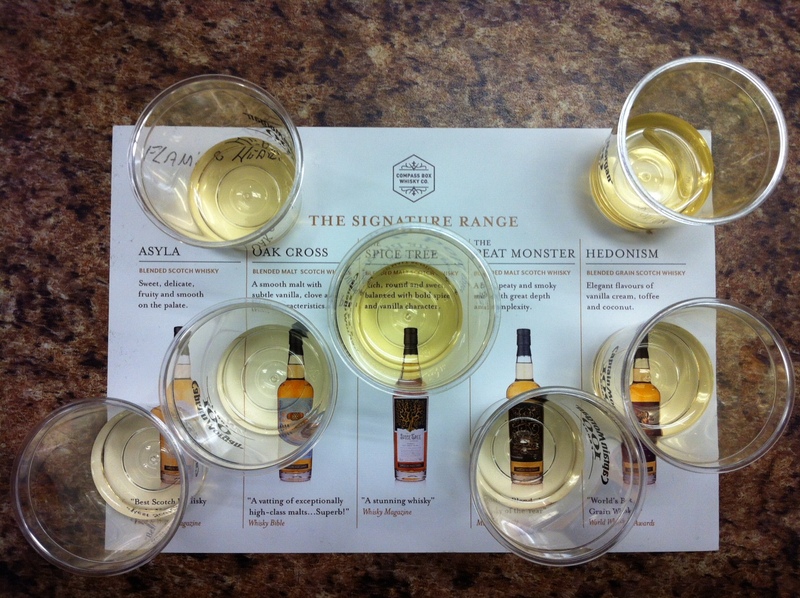 I hope I was able to share my passion for the Scotch Whisky – but I’m curious to hear what do you think about Scotch? Also, just so you know, in our next post we will insert only one letter ‘e” into the word Whisky, to discover to whole huge world of Whiskey. Until then – happy dramming! I’m sure everybody loves the holiday season – at least in the US, where the holiday season is typically the time between Thanksgiving and Christmas. While there are many reasons for that, I think the wine lovers can have their own additional reason. All things wine make the perfect gift, and the wine stores want you to remember that – particularly, by running a lot more wine tasting events and bringing out more interesting wines! 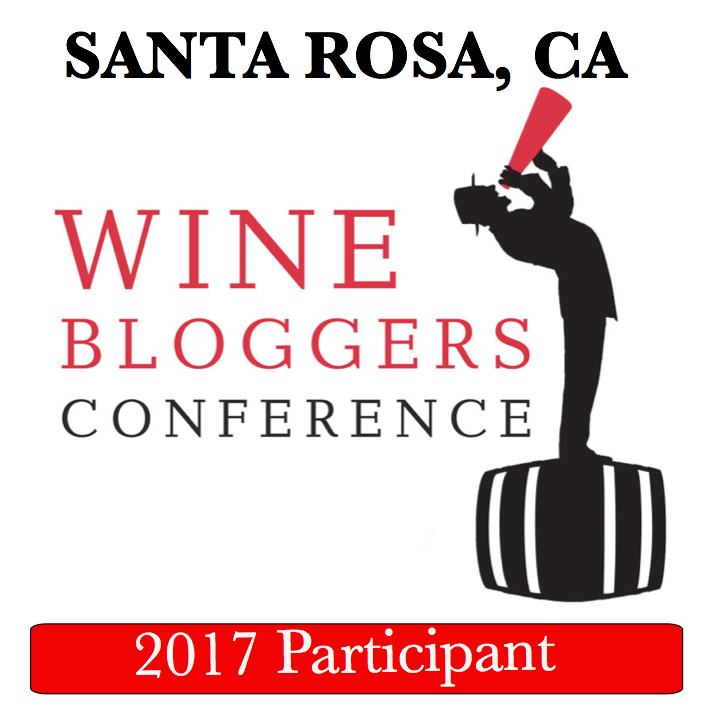 Along these lines, I had an opportunity to taste a few of the great wines and whiskies, which I want to share with you here. Let me start with the wines first. And now, here comes Whisky. I will present to you 4 different whiskies – care to guess where they came from? I will give you a few seconds to think about it. So they actually came from … Scotland (of course), Japan and North Carolina! Blue Ridge Distilling Defiant Whisky, North Carolina (41% ABV, 100% Malted Barley) – what a treat! This Whisky has a great story, which is well captured on the distillery’s web site and in this Huffington post article, so I will have to defer you to those sources for the full information. I can only tell you that this is a very young distillery (a bit older than one year), which uses a unique ageing process, where toasted white oak spirals are used instead of a cask to impart the color and character. This was a perfect whisky – smooth, round, with a touch of sweetness and perfect, oily, silky viscosity and texture, which is the trait of some of the best Scotland single malts. If you like whisky, this is something you have to experience to believe it. Outstanding. Nikka Whisky Taketsuru Single Malt 12 Years Old, Japan (40% ABV) – Japanese Whisky are so hard to find! I have most of my experience with Yamazaki and Hibiki, both of which are some of my favorite. This Nikka Taketsuru 12 y.o. was nice but rather simple, without much of the explicit character. At around $70/bottle, this might not be the best choice for the money. Nikka Whisky Yoichi Single Malt 15 Year Old, Japan (45% ABV) – this was a lot more interesting than the previous one – playful on the palate, with good power, hint of caramel, crisp acidity, nice and balanced. While this is a good dram, the pricing still makes the value somewhat questionable – at around $115, I’m not sure this would be the best investment. The Lost Distillery Company Auchnagie Blended Malt Whisky (46% ABV) – in a word, spectacular! One of the best whisky I ever tasted, one of the very best! It also comes with the great story. The Lost Distillery Company has its mission to recreate the whisky made by some of the best distilleries in Scotland, which are long gone (actually, there are hundreds of those). Auchnagie, which existed for almost hundred years, 1812-1911, was a farm distillery located in Highlands. Recreation of the Auchnagie whisky was one of the first projects undertaken by The Lost Distillery Company – I can only direct you to their web site where you can read pages and pages of detailed research information. And to tell you the truth, I wouldn’t dare to describe this whisky from that few second I had to taste it (it was mostly a moaning session). I will hopefully get a bottle at some point and will write the whole dedicated post as this beverage deserves. But – if you are a whisky aficionado, I have only two words for you – find it! It is truly spectacular and you don’t want to miss it. Also, at around $65 /bottle, it worth every penny for the countless amount of pleasure it will bring. That’s all I have for you today. Happy Monday and a great week to all! Cheers! Quick trip to Scotland, anyone? Seriously, do you want to hear the wind and embrace the land? This is easy – turn the sound on and click here. Do you want to make your experience even more realistic? Pour yourself a splash of Bruichladdich (may be even while sitting next to the fireplace), and you are there. You probably figured by now that today we are once again going to talk about Scotch. If last week I was talking about the art of blending, as present by Compass Box, today I want to talk about pure character. 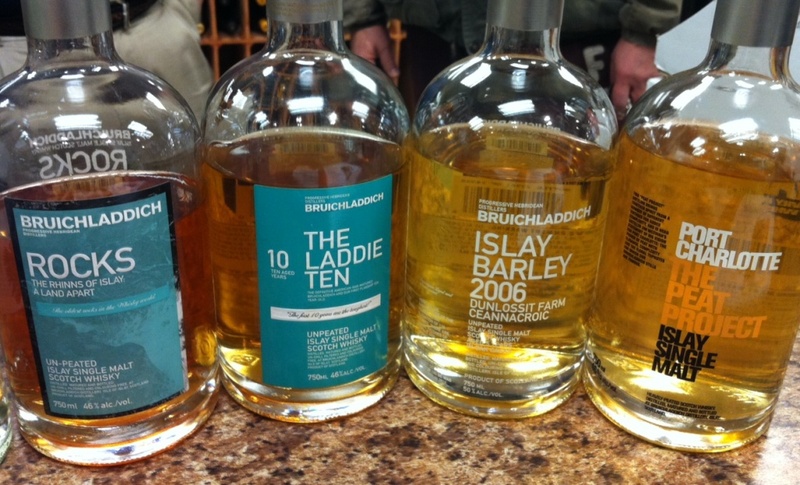 Few days ago I tasted some new Scotches coming from Bruichladdich, a distillery located on island of Islay. Islay is one of the main areas in the Scotch production (the others are Highlands, Lowlands and Speyside), famous for their Scotches to be very peaty, smoky both on the nose and the palate. Bruichladdich distillery is about 130 years old, definitely not the oldest, but considering the number of new products and limited releases I would dare to say, one of the most innovative. The proof is in the pudding, right? Err, in the Scotch in our case. So in the tasting, I had 4 different Bruichladdich Scotches which I never tasted before. Bruichladdich Rocks was the lightest from the group – nice touch of smoke on the nose, very floral and mellow on the palate, as light and refreshing as Scotch can be (distillery tasting notes can be found here). .
Bruchladdich The Laddie Ten, as the name says, is 10 years old single malt – touch of iodine on the nose (not anywhere as medicinal as Talisker, with only a whiff of iodine), excellent, soft, round, with good viscosity, very gentle for what it is (distillery tasting notes can be found here). Bruichladdich Islay Barley 2006 – yes, it is a very young Scotch, which I’m not even sure has a specific definition in the world of Scotch. Not only this is single malt, but all the barley used in production of this scotch comes from one specific farm (a single farm single malt?). Really unusual (especially for Islay), pure caramel on the nose, round and delicious (while I really enjoyed it, it felt more like “ladies scotch”). Again, here are the distillery tasting notes. Bruichladdich Port Charlotte – The Peat Project – ahh, pure classic. This was classic Islay. Perfectly peaty and perfectly restrained at the same time. 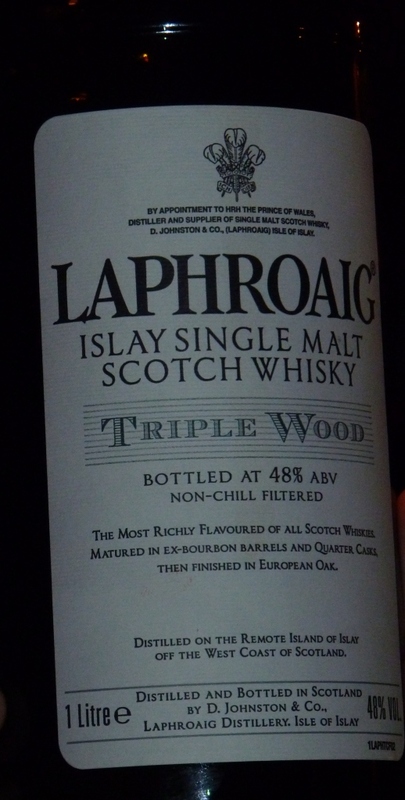 Bacony smoke on the nose, round, smooth, elegantly peaty on the palate and delicately weaved. While you can read the distillery notes here, I can’t help it but to cite a line from the description: “bottled using Islay spring water from the Octomore field of farmer James Brown” – does it get any better than that? Our tour of Islay is over, folks. Go grab a bottle of Bruichladdich and enjoy the spirit and the character of the land. Cheers! Innovation. This word is usually associated with high-tech industry, new cars, new gadgets, an iPhone 6 or 7 – I’m sure you got my point. Yet innovation is not a foreign word when we talk about food, and wine, and the other stuff we drink, even though the original concept didn’t change in many thousands or at least many hundreds of years. If you scroll through the posts in this blog, you will see that most of them are about wine and food (with a bit of photography). However, from time to time I step outside of the wine world and talk about my second favorite type of enjoyable alcohol, Scotch – and this will be the subject of this post. What was with all that talk about innovation, you ask? 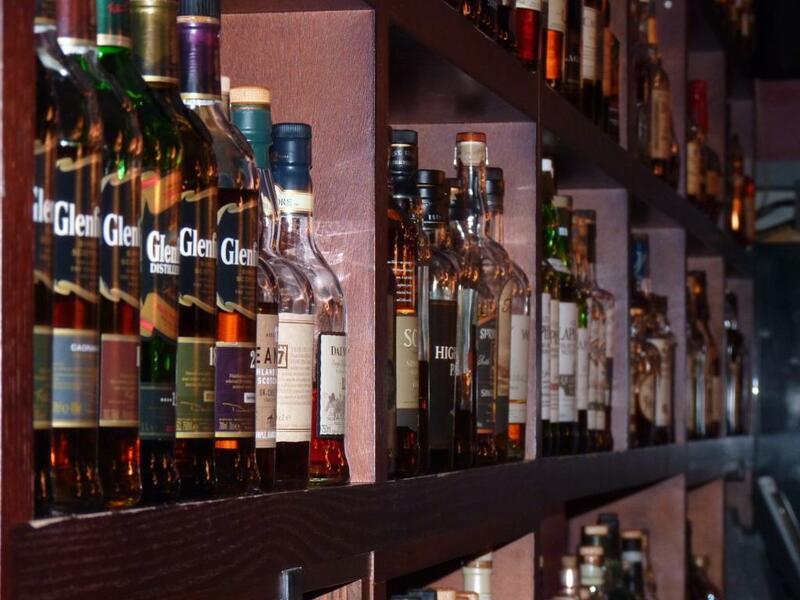 When it comes to Scotch, many of the products are deeply rooted in tradition. Yes, some distillery might change the label or the packaging, and that would be about the full extent of innovation. But then there are companies such as Compass Box – a relative newcomer in the world of fine whisky. Compass Box had a vision – a vision of taking the existent best of the breed whiskys from the different regions, aging them in the best available wood and then blending them together to create a new line of products which would be unique and exemplary at the same time. Most importantly – they managed to succeed with that approach and took their rightful place in the market. About two month ago I had an opportunity to taste through the whole line of Signature Range of Compass Box whiskys, so here are my notes from that tasting. Hedonism – very viscous on the nose, nice, delicate, with touch of sweetness, very round – very nice, distinctly different from anything else. Flaming Heart – beautiful. Peaty but very balanced. 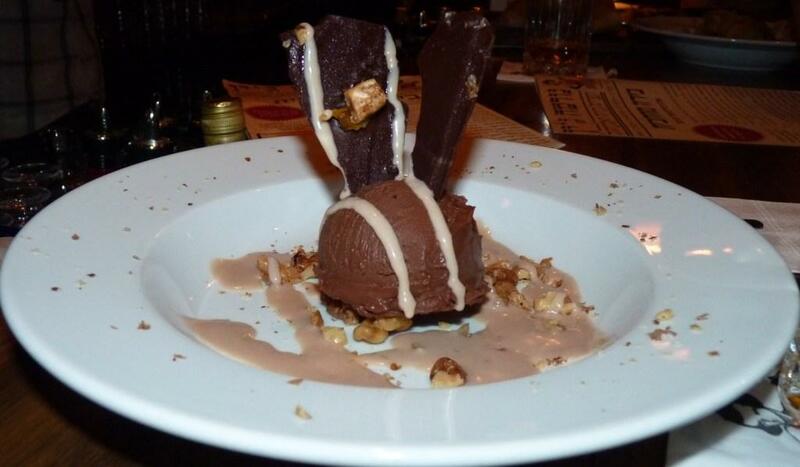 Best of tasting. 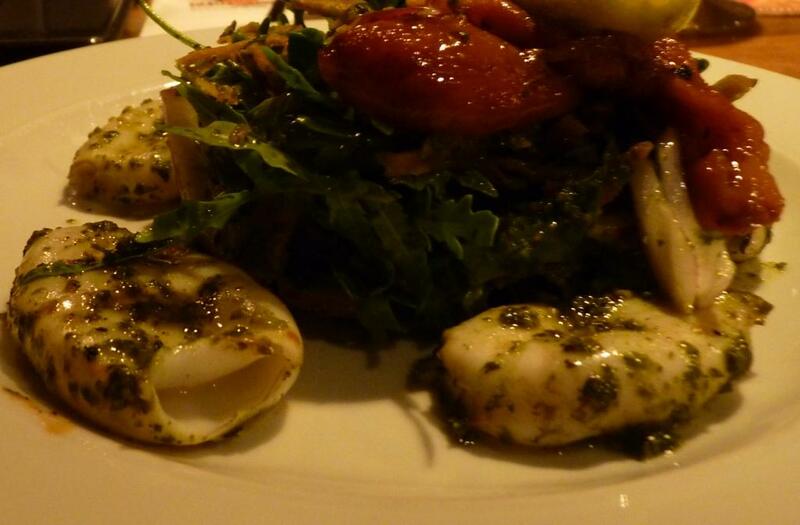 Orangerie – nice addition of fresh orange, very delicious. I also sneaked by (no, I didn’t steal anything, I was offered the taste) Johnnie Walker Blue King George V Edition, which is pretty rare and needless to say, expensive – very oily in appearance and on the nose, but then super clean and fragrant on the palate, very very round (if you are into Scotch, this one should be on your “must try list”). That is all I wanted to share with you, folks. If you know of Compass Box scotches and enjoy them, pour yourself another splash. 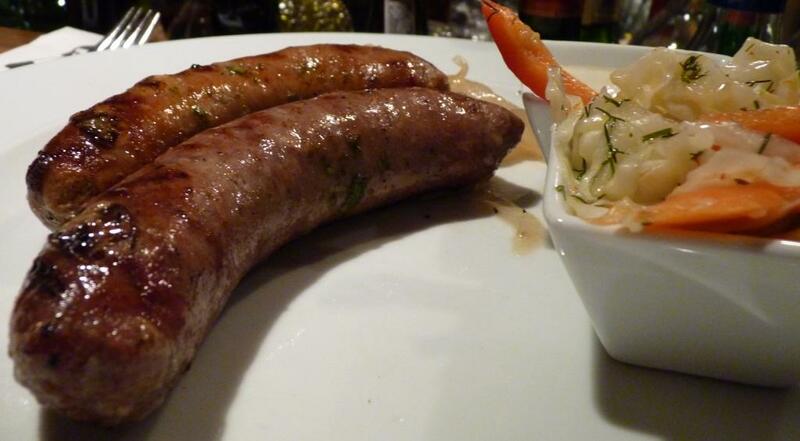 If you never heard of them, try one – you might discover something new. If you don’t like scotch, there is a good chance you just didn’t happen to find the right one yet – keep trying as you might come across the one which will speak to you… Cheers! 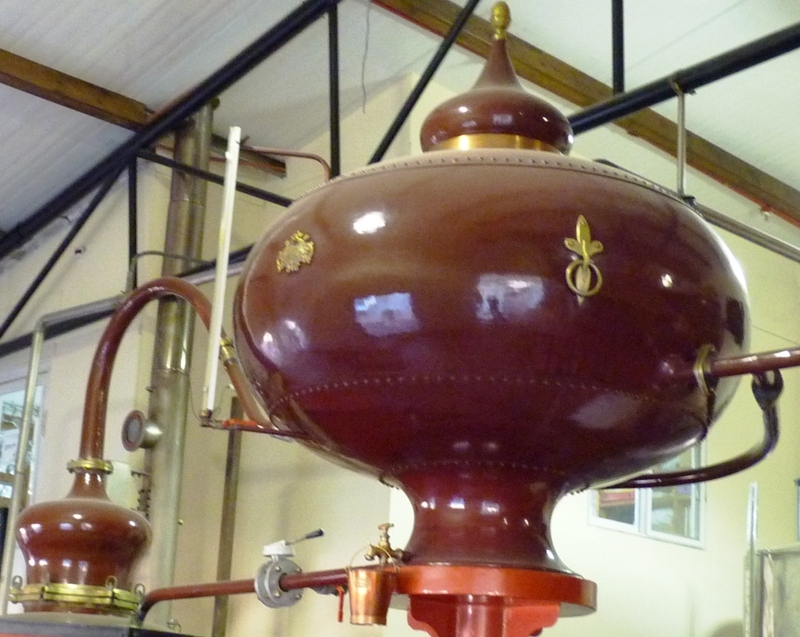 Weekly Wine Quiz #15 – Most Historically Significant Spirit? 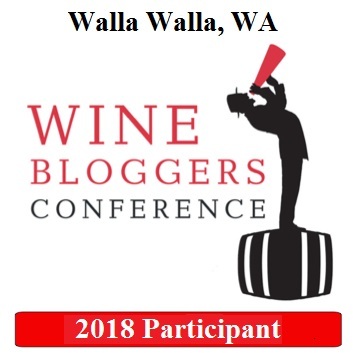 We are continuing the historical angle here, but stepping aside from the softer world of wine into the brave and powerful world of strong spirit (yeah, I know you can read it in different ways) – I’m talking about so called hard liquors. Hard liquors came about some time in 14th – 15th centuries, when the alchemists of all walks were perfecting distillation process in their search for the ways to turn everything into a gold (or maybe they were searching for eternal life elixir?). It was quickly discovered that the hard liquors have a great range of effects on humans, from giving them pleasure to making them completely crazy and even killing them. During the course of history, hard liquors played wide variety of roles, from being an object of trade, a currency, to the object of desire and status symbol (Louis XIII, anyone?). Each spirit has it’s own rich and unique history, full of all the human drama, discovery, excitement, love, hate and everything else which constitutes life (it is not for nothing French call some of their liquors Eau de Vie, a Water of Life). And of course each spirit affected hundreds of millions of lives throughout its course of history. However, there is one hard liquor which can be singled out for its role in the history of western civilization, where it was even an essential part of the slavery trade (the whole process was called “slavery triangle”), and its status was dramatically affected by the American Revolution. Do you know what spirit it is? Have a fun filled weekend! Cheers! As you probably know, scotch is my second favorite drink, right after the wine. When it comes to scotch, I pretty much like all of them, with slight bias towards the smoky style. One of the most unique smoky whiskies is Talisker (one of my favorites), which has a very unique, almost medicinal nose full of smoke, in addition to lots of smoke on the palate (it is different from traditional Islay whiskies which have very expressed smokiness on the palate, but not as much on the nose). When my friend Zak said “you have to try this” and pointed to the bottle of Whiskey, I couldn’t believe it – single malt whisky … from Oregon? What is happening? Well, tasting is believing (seeing is not enough) – and when I tried this McCarthy’s Single Malt Whiskey I was literally blown away. While this whiskey is compared to Lagavulin (probably the most classic Islay scotch) on the producer’s web site, my first impression was Talisker. I’m quite convinced that in a blind tasting I would confuse this whiskey for Talisker, both from the smell and the taste ( this probably shows my weak side, but I will live with it). On the nose, this whiskey exhibited the same medicinal smoky flavor, with lots of smoke following on the palate, with expressed minerality and perfect balancing acidity – this scotch was literally refreshing, if scotch can be considered a refreshing drink. 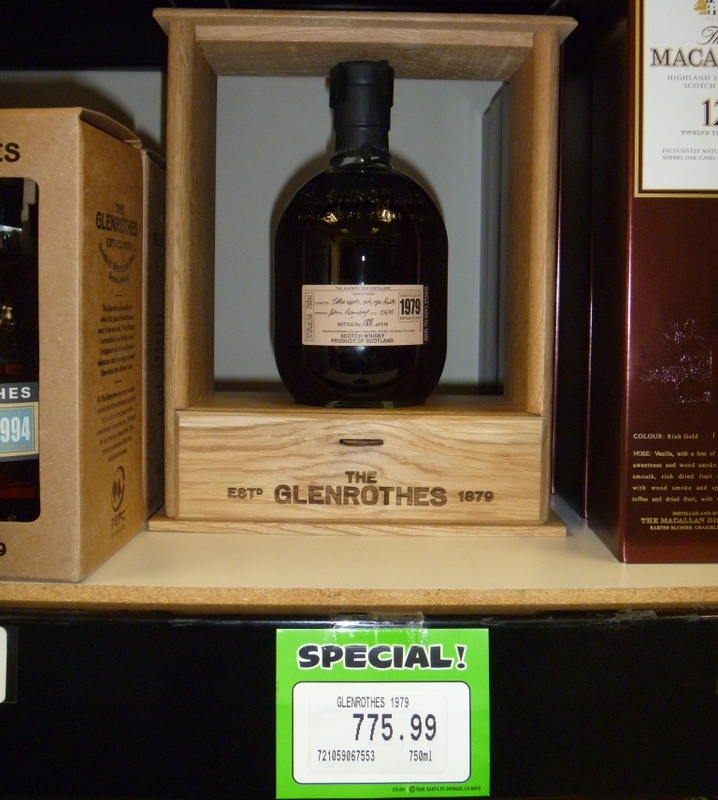 At $49.99 at Cost less Wines and Liquors, I think it is a great deal – if you like smoky peaty scotch, don’t miss it. ‘Nuf said… Until the next time – cheers! Among many bars, I’ve seen those where you will pay $500 for a shot, and but I never saw the one with such a selection of really great scotches which you can actually afford! The smoke flavor and bite on this one were immense, like breathing the air coming from the smoker (or may be just chewing on the cigar :)). Too strong by itself, addition of 3 drops of water made a miracle – the scotch opened up beautifully, with big flavor profile and lots of depth. Great way to finish the evening of great tasting food and drinks. I know that the picture worth a thousand words, and this is why you can see a lot of pictures. 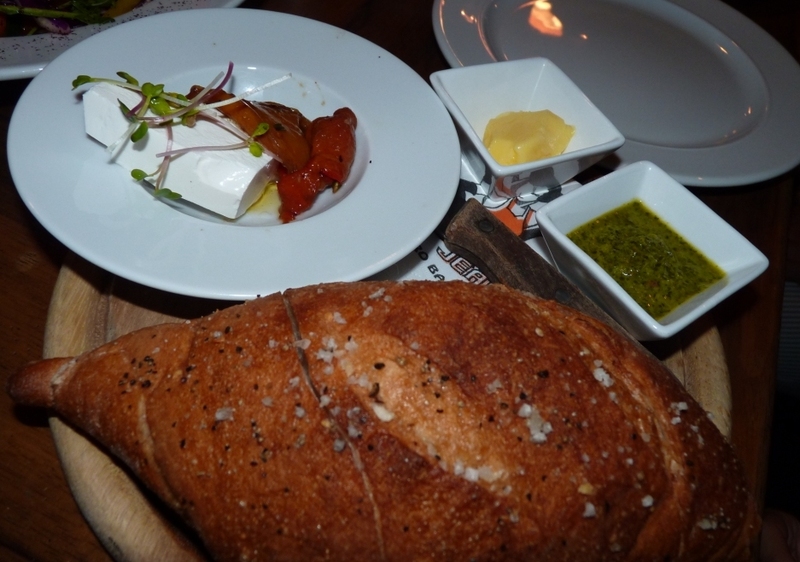 However, one should really experience the taste, this is where picture fails short – and this is why, if you even the smallest opportunity – head to Norma Jean in Tel-Aviv, you will not be disappointed.